How will Annihilate interact with B1? Does annihilate actually cause damage to non-raid bosses? Will DN gain exactly 1 max health if some poor **** annihilates B1 due to B1’s unique? Or will DN gain max Health equivalent to the “advertised” health of B1? Or will there be no Max Health gain? The description of annihilate does not indicate that a target must be defeated in order to gain the max health bonus. Will B1 lose 8 stacks of droid battalion if annihilated? Zero stacks of droid battalion? Something else? This game seriously needs both a glossary and to eliminate superlatives in descriptions. 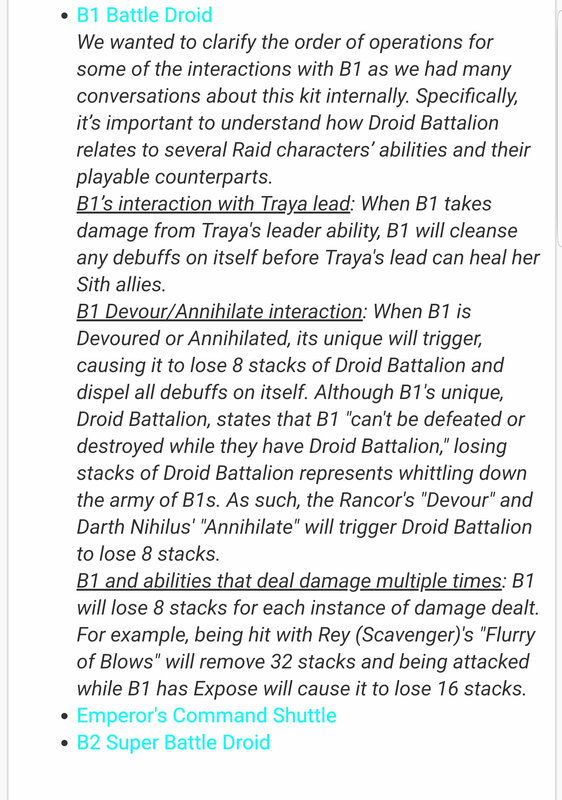 My personal suggestion: allow Annihilate to bring B1’s Droid Battalion down to exactly 1. This would allow for the mechanic to continue and continue the “endless wave of droids” idea and the possibility of B1 “healing,” without really watering-down DN. Annihilate will simply remove 8 stacks of droid battalion. B1 already gets shafted by multi-attacks and assists, because he is not one unit but an army of B1s. He doesn’t also need to be vulnerable to annihilate. He loses eight stacks. It's in the megathread of the kit reveal. They added an explanation in a recent update post, to clarify things. Which isn't right as annihilate doesn't deal damage (the requirement for B1 to lose 8 stacks, he needs to take damage). So annihilate would be a completely wasted ability vs B1. As it has alrdy been pointed out by ppl in the kit reveal thread I really hope that there will be an update on Nihilus' AI to ignore the B1 when annihilate is ready. Except the devs have defined how it will interact, as has already been stated. B1 can't be immune to it, so they're treating it as if it's been hit once by removing 8 stacks. Makes sense to me - DN annihilates some of the battalion, but not all of it. Did you read the update notes? Removes 8 stacks, as per the dev team. View it literally as every 8 stacks being a Battle Droid. So there are 12 Total Battle Droids. When Nihlus Annihilates he kills 1 Droid. That's it. He doesn't kill all 12, and he doesn't kill nothing. Thematically it makes perfect sense. Don't stress about perfect wording, this isn't a tabletop game where they release glossaries and rulebooks. Should add a line to B1's unique then about "Devour" and "Annihilate". Agree, a line about any "instant kill" skill should be added. LOL, you want too many paragraphs in unique descriptions. B1 is going to require a new strategy for DS to defeat. Annihilate, Execute, Terminate knock off 8 stacks each and with only 1 HP, Overpower can't kick in. Curious to see interaction with Isolate and the above abilities, Isolate prevents buffs from recurring except locked ones. Isolated B1 won't assist, won't gain buffs (can still gain battalion stacks as that's not a buff), won't gain TM outside it's turn. Isolate pretty much shuts down B1 because it doesn't do any damage. However you would need to be sure to not use any AOEs after that because once B1 dies, isolate will most likely go away. Will using EP’s let the hate flow kill B1? Seems possible, it does deal damage, so it should remove 8 stacks. Instantly defeat target enemy is a fancy way of saying reduce target enemies to the lowest health possible. That’s why Saviour and I breakable will Counter annihilate. It is not damage in the sense of -hp. It is damage in the sense of reducing hp. In a way, reduce max health to 0/1. Then unresistable damage is added to change protection and hp to 1. In that instance, B1 takes 1 damage. And then revives. Basically annihilate deals varying damage based on the target. Sorry, meant change hp/prot to 0. Because only BoW damage doesn't trigger "on damage" effects and it has nothing to do with P1.